I don’t know when Breakfast became the new dessert, but it totally did! And I for one am glad, because drinking chocolate in the morning is so worth it! What’s the catch you ask? It’s healthy! That’s the catch! It’s sugar-free, dairy-free, gluten-free, Paleo, Vegan, Nut-free and is decadent and delicious. How are all those phrases in one sentence – I know! And I know you are thinking ewe. But don’t call it crazy just yet. First, taste it. I have such a sweet tooth, but I like to create my smoothies without sugar. You know to prevent that sugar high low crash thing that sugar is so known for? I’m kicking that part to the curb. 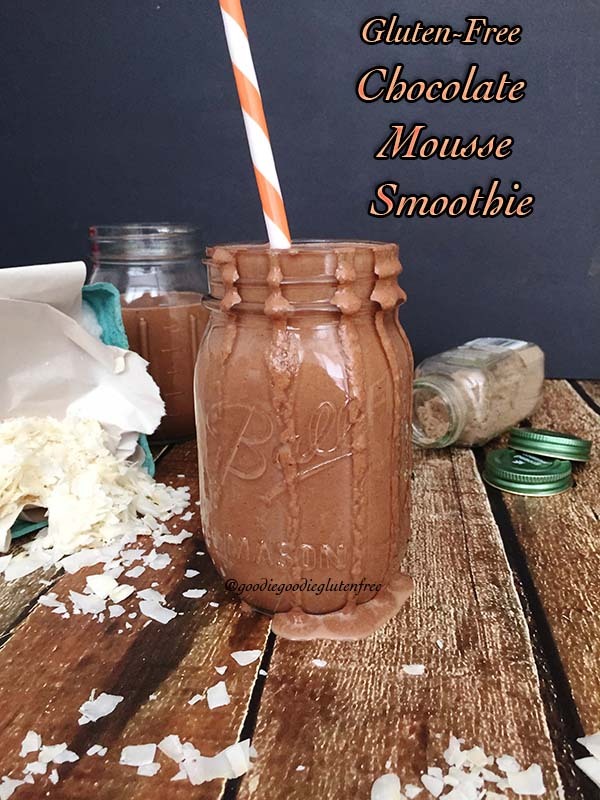 So you would think that cuts out a whole lot in the smoothie department, but when I started to have these crazy food sensitivities, I had no other choice but to get creative and think outside the box. I mean I guess I could have thrown in the towel and given up on my favorite breakfast of all time. But instead, I chose to work with all the other plant based amazing ingredients there are. And guess what? There is life after nut milk, nut butters, bananas, sugar, spinach and kale. When these food sensitivities started I realized I could help people in more ways then just with a gluten-free diet. At this point in my life, I am more then just someone with Celiac Disease. I have a lot of unexplained food sensitivities and inflammatory medical issues and the creations I make can help others just as much as they have helped me. I have never seen so many smoothie books out in Barnes and Noble, Amazon and on Instagram that use SO MUCH SUGAR and while I get wildly inspired by these books, bloggers, and instagram accounts, I also know that for most and for myself, that amount of sugar is not workable. So I get inspired, and then I create smoothies in healthier ways. I also know way too many people trying to get off sugar and dairy. I get lots of emails about food sensitivities too. I realized that if I didn’t share my heavenly treats and advice about how I got through, going through, getting through and eating through then I was doing a disservice to myself and to you. I am all about sharing the love. So, today I am sharing the zucchini and chocolate love. Yup zucchini. So you have heard of zucchini noodles, zucchini brownies, zucchini bread right? Let me introduce you to the zucchini smoothie. Coconut – healthy fat, reduces sugar cravings, helps with vitamin D absorption since Vitamin D is a fat soluble vitamin, and sticks to healthy fats, is anti-inflammatory and anti-bacterial. Zucchini – a green veggie that has loads of vitamin C, Lutein and Zeaxanthin which are two phytonutrients that belong to the carotenoid family, which is the same nutrient family that includes beta-carotene, a source of vitamin A. Both promote healthy eyesight, and also contains Manganese, an essential mineral that protects your tissues from harmful free radicals, and essential for wound healing. Flax – promotes healthy bowels, skin and hair. Flax is a healthy fat. Except the ice, Blend all ingredients together until smooth. Once blended smooth add ice and blend again. Always drink a smoothie with a straw and cold. It’s the best that way! Sub in spinach, mixed greens or mixed lettuces for butter lettuce and romaine. If using Carob, use only 1 T. and gauge taste. Then add more if desired. Need it to be more chocolatey? Add an additional T.
Sub almond milk, cashew milk, Tigernut milk, hemp milk or quinoa milk for coconut milk. Hate avocado? You can totally omit it, just use less liquid. Need your milk to be sweeter? Use the sweetened version. *The sweeter options above are not suitable for the Candida diet. Are you ready to make this or what? Gluten-free, Dairy-Free, Nut-Free, Vegan, Paleo, Sugar-Free, Candida-Friendly deliciousness. 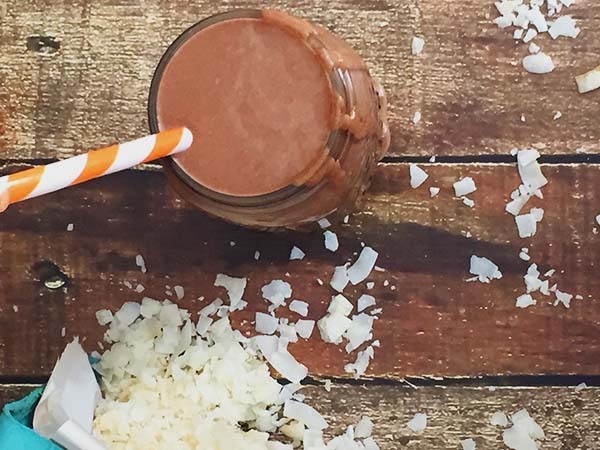 You can't go wrong with Avocado, chocolate and coconut! Optional changes: Sub in spinach, mixed greens or mixed lettuces for butter lettuce and romaine. If using Carob, use only 1 T. and gauge taste, then add more if desired. Need it to be more chocolatey? Add an additional T. Sub almond milk, cashew milk, Tigernut milk, hemp milk or quinoa milk for coconut milk. Hate avocado? You can totally omit it, just use less liquid. Need your milk to be sweeter? Use the sweetened version. Need it to be sweeter? Add 2 pitted medjool dates. The sweeter options above are not suitable for the Candida diet. « 3 Ways To Alleviate Stress NOW!